Editor-in-Chief Dr. Christopher R. Trogan, United States Merchant Marine Academy, USA. International Journal of Philosophy and Theology is an international journal that addresses all areas of interest to both philosophy and theology. The Journal publishes original research and review articles. 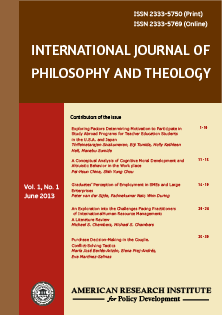 The journal strives to strengthen connections between research and practice, so enhancing professional development and improving practice within the field of philosophy and theology. Papers accepted for publication are double-blind refereed to ensure academic integrity. Each paper published in International Journal of Philosophy and Theology is assigned a DOI®number, which appears beneath the author's affiliation in the published paper. Click HERE to know what is DOI (Digital Object Identifier)? Click HERE to retrieve Digital Object Identifiers (DOIs) for journal articles, books, and chapters. Christopher R. Trogan, Ph.D, United States Merchant Marine Academy, USA. Dr. Joseph E. David, Associate Professor, University of Oxford, UK. Dr. Mehmet ŞANVER, Department of Religion and Philosophy, Uludağ University, Turkey. Dr. Abdul Hafeez Fāzli, Professor of Philosophy, University of the Punjab, Lahore, Pakistan. Ms. Helma Jankauskaitė, Mykolas RomerisUniversity, Vilnius, Lithuania. Prof. Dr. Ibrahim Abu Bakar, Department of Theology and Philosophy, The National University of Malaysia (NUM). Dr. Elizabeth Ezenweke, Dept. of Religion and Human Relations, Nnamdi Azikiwe University, Awka, Anambra, Nigeria. Dr Asyraf Hj Ab Rahman, Universiti Malaysia Terengganu, Malaysia. Dr. Alubabari Desmond Nbete, Department of Philosophy, University of Port Harcourt, Nigeria. Dr. Raudlotul Firdaus binti Fatah Yasin, International Islamic University Malaysia. Revd. John Arierhi Ottuh, Ph.D; Dept. of Church/administration, Winners Baptist Church, Nigeria.